Objective: Travel through the lands around the village and rescue the lost family. Mission description: A man came walking out of the wilds barely alive. He was taken to the local hospital where he reported his family was lost in the wild lands. Find them. Mission details: The rest of the family is grouped together, wandering aimlessly and completely lost several miles from the nearest road. Once you find them, they will follow you slowly, as they are dehydrated and weak. Just go slowly, and bring them to the village for treatment. Pale eyes stared back into space, looking up at the blank white ceiling of the hospital. They were lifeless, almost devoid of any emotion or sparkle, normally associated with that of an individual on the brink of death, with the grim reaper’s scythe by his throat. The only indication that he wasn’t lost was the faint rise and fall of his chest, and the steady beep of the electrocardiogram. His lips quivered as the man struggled to find strength to utter the only words he’d been able to say for the past day of his treatment. Bringing Mikasa to the patient’s confidential room, set aside for his emergency treatment of a man sparse on nutrients and water, was entirely optional on part of the Village Hidden in the Leaves. Perhaps one of the less strict villages on the continent, the sentiment they invested into their actions spoke of a heart that Mikasa could not say she respected. She’d been escorted to this poor soul’s hospital room after the briefing on her mission parameters. Perhaps the village believed it would empower the ninja to have an intrinsic reason to complete the mission, but Mikasa’s implicit motivations were more than sufficient to move the girl into seeking all three members of his family. The Land of Fire was vast and immune to pitiful search efforts that spanned far and wide. Trees and forestry hid from prying eyes any injured animal needing immediate treatment. Wild animals that lurked in the woodlands would seek to devour as much as they sought to rescue. Vile hearts roamed where feet seldom tread preying on their next profitable human. Time was sparse and the chances of their living even more so. The Ackerman, hailing from the Land of Wind, knew simply how ruthless Mother Nature could be if you handed her your life on a silver platter. Gender was indistinct and age was of no concern; she swallowed up her quarry with no qualms or agony. The man had been brought in through the south gate, dying of thirst and hunger and bleeding throughout his body from self-inflicted wounds of dragging his frame across gravel and rigid dirt. He had been rushed to be nursed, but his spirit remained as broken as the day he was admitted from the fear of his family suffering as greatly as he did. Mikasa could still spot the unwashed ground caked with his dry blood, where others would have mistaken such splotches as a diversity of the local terrain. But no earth was as rough as dried blood, especially to a girl who had once been drenched in the sticky, slick crimson substance of her parents. 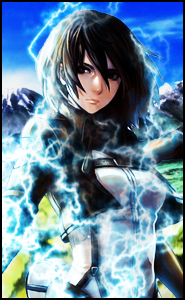 Mikasa made her brisk way to one of the multiple guards standing on duty. They were dressed in the Village Hidden in the Leaves’ standard uniform, a sleeveless green flak jacket decorated with an abundance of pockets. The proud symbol of the village, engraved in hard polished metal, was attached firmly to the bands wrapped around their foreheads. She noticed distinct differences between the two women who occupied the left half of the gate, notably the scar on one’s lower lip, and the lack of an ear on one of their heads, but the two otherwise portrayed themselves visually similar to the other. “Were you two here the day this man was brought in?” Mikasa inquired, holding up a photograph with his unconscious face plastered on the front amidst a white background, speculatively taken against the walls of the hospital on the day of his admittance, if she looked at his blood-caked clothes against skin unmarred as the day he was born. The village stamp at the bottom right corner left them no room for argument, as it cited Mikasa’s place on the mission on behalf of the village. 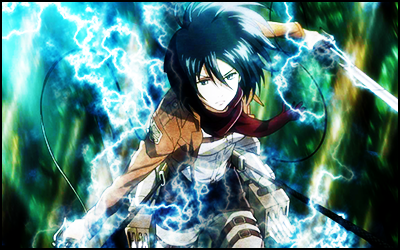 “Thank you,” Mikasa answered, taking quick steps in that direction. It led to where her preliminary investigations brought her, but a confirmation was satisfactory in knowing his family was likely within the area. The girl closed her eyes, a rarity for a kunoichi bred for the purpose of combat, and reached out with her senses. The bioelectricity of people was one distinct to each person, and while she could not claim to be proficient enough in this sensory technique’s use, to be able to locate masses of people and small fragments of them was an expertise one did not need to polish. She felt the heavy concentrations of electricity along the road, but surely far too many to be the man’s small family of three. His mother, daughter, and son would also be near stagnant, not moving from the malnourishment of their trek-gone-wrong. The woman moved to one side to better concentrate, not wishing to accidentally obstruct anyone’s journey on their destination to the Village Hidden in the Leaves, and she reached out with her senses once more, ignoring as best she could the shining beacons of electricity around her that detracted from her goal of the very small and needy. Mikasa then moved further and further away from the large concentrations of chakra, focusing each time at an estimated fifty meter intervals in an attempt to locate the elusive trio, who with each passing second were likely suffering greater and greater aggregates of pain, both physically paralysing and emotionally crippling, what with the man of the family having never returned from what she assumed was his expedition to seek help from any part of civilisation, or collapse trying. It took her a few moments, but the girl was able to lock onto the signatures that were being emitted to the edge of her senses, sprinting quickly to the location to find the three that matched the man’s exact description, and slowly but surely helping them back onto the main road, and into the heart of the Leaf.